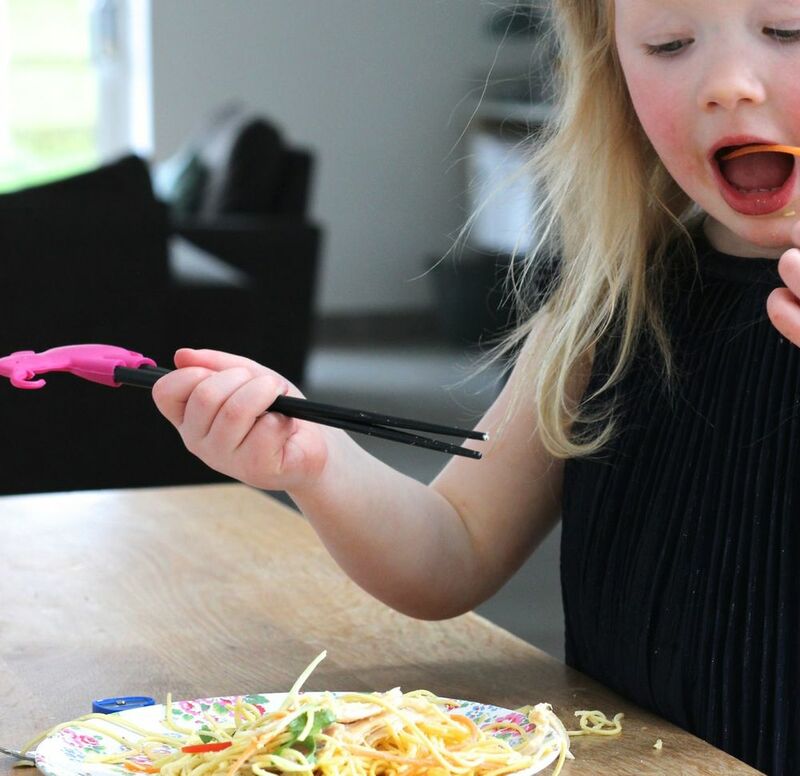 Little kids like eating noodles because they're a bit interactive - a good excuse for slurping up noodles, finger-picking at bits of veg and having a go with trainer chopsticks. This salad uses ingredients you might have knocking about without having to do a food shop: a nest of noodles, a stray carrot or pepper, a few mange tout. You can add a little leftover roast chicken if you have some or leave it out for a vegetarian version. The dressed noodles will sit quite happily for a day in the fridge so you can make it ahead of time, save some for a packed lunch, or feed just the kids some at 5 o'clock and then tu(c)k into the rest later with a cold beer. In this instance, dress a grown-up plate up with sliced red chillies, if you like. And if you don't want chilli in the kids' portions at all, just leave it out of the dressing altogether and add sliced red chillies to your plates at the end. 1. Boil the kettle. Pop the noodles in a large mixing bowl and cover, just, with the boiling water. Leave for 5 minutes to soften then drain in a colander and run under the cold tap. Set aside in the bowl for a moment. 2. Get the kids to help you whizz up the dressing in a food processor: pop in the chilli (if using), peanut butter and soy sauce. Peel and grate in the ginger and squeeze in the juice of one of your limes. Blitz - add a little water, splash by splash, to loosen to a dressing. You may need to stop the processor and scrape the dressing down from the sides with a spatula then whizz again until it's all well combined. 3. Show the kids how to top and tail the spring onions with a pair of kitchen scissors. Cut each length into thirds with a small knife then thinly shred (adults only). Put the shredded onions in a little bowl, cut the second lime in half and squeeze over them (this takes the heat out of the onion). 4. Top and tail the carrot and peel with a veggie peeler. Older kids can have a go at shredding with a hand-held julienne shredder like this one (beware it's sharp so pay attention and make sure their fingers aren't anywhere near the blades). Failing that, grate by hand or shred in a food processor. You can slice the red pepper in there too or do it by hand with a knife. Shred the mange tout or sugar snap peas on the horizontal, you can blanch them briefly in hot water if you like (3 minutes) but we like them thinly shredded, coated in dressing and raw for a bit of crunch. 5. Now get the kids to help you put the salad together. Add the spring onions (and lime juice) to the noodles in the bowl, along with the carrot, pepper and mange tout. Throw in the shredded chicken (if using). Pour in the dressing and show the kids how to use tongs to mix it up. Rip up the coriander and mint, sprinkle over the noodles then mix again. Adults can sprinkle over a little sliced red chilli.